Posted 5/5/2011 8:45am by Ben Wenk. This blog is the sixth entry in our "Growing Greener" series - a collection of blog entries focused on educating our customers about our growing practices and other things about our farm that make us a unique farming operation. This is a follow-up to August's "Food Alliance Certified" and is intended to address what our certification means in more specific terms - think Food Alliance, ver 2.1. I hear what you're saying and I can understand your confusion. "I'm glad you guys are Food Alliance certified... I don't know what it means." We introduced the topic on our blog last year with the big announcement in August but we want you to know just exactly what this means. Food Alliance certification, you might recall, encompasses four general principles, as laid out in their certification standards. These areas of concentration are growing practices, soil and water conservation, wildlife inhabitation on the farm, and fair and responsibile employment practices. There are also baseline, "whole farm" conditions that must be met before we can become certified. We also have to commit to continual improvement of practices on our farm and its in these last two areas that we'll begin our Food Alliance 2.1 analysis today. 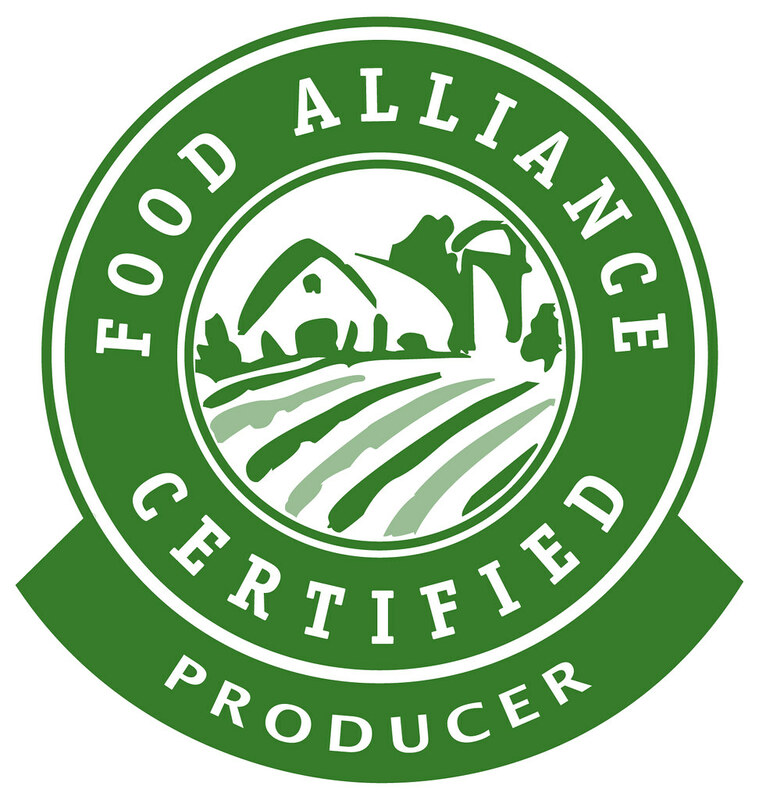 So what does it mean to be a Food Alliance certified producer? There are guidelines for nearly any type of farm out there, I'm going to stick to what I know best - what it takes for us to be a Food Alliance certified producer. 1) produce Food Alliance certified products - this is to say we've passed our crop-specific audit and the food we produce complies with those standards specific to sustainable production of apples, peaches, pears, and cherries in our case. 2) provide safe and fair working conditions - in our case this covers everything from the obvious farm worker safety issues to our more progressive practices such as negotiating wages, providing opportunities for promotion, and providing health insurance for our workers. 3) practicing IPM to minimize pesticide use and toxicity - this is perhaps the effort you know most about on our farm. If not, catch up on how we scout for problems, mating disruption practices, lower toxicity materials, and this video on our practices. 4) soil and nutrient management - At our farm, this includes a long term rotational strategy between orchard plantings - often with minimal tillage. Hopefully soon, I'll include a blog with pictures of my father's very effective new erosion preventative no till sod establishment in orchards - it's a sweet system. 5) protect biodiversity and wildlife habitat - As part of our continuing improvement of practices for Food Alliance, we've established wild flower plantings to increase our biodiversity, specifically the population of native, feral pollinators. We also effort to increase populations of insect eaters like bats and barn swallows while also leaving standing deadwood for raptors, aiding in mouse control in our orchards. Continually improving practices - here's where Food Alliance really sets themselves apart from other certifications. Some certifications have a standard "bar" that's raised and periodically, every few years, you have to prove that you're getting your chin above the bar for another review cycle. In the case of the Food Alliance, the onus is on us, the producer, to continually raise our own bar. Farming is a constant progression - you'll see evidence of it in every good farm I can think of. For the Food Alliance, they embrace this concept by requiring certified producers to commit to continual improvement in each of the four stated areas of concentration, insuring Food Alliance certified farms maintain the leading edge of progress and innovation in sustainable agriculture. These goals are specifically named and tackled over a one, three, and five year time frame. We were just certified in August and they already want updated on our progress in completing these goals. I'm proud to say these goals are already being met around our farm. In additional to the wild flower plantings referenced above, we are having all of our employee manuals and training materials expertly translated into Spanish. We will have bat boxes around out around all of our farm ponds in another year and are working towards 100% mating disruption in our acreage. Are they ambitious and difficult? In many ways, yes they certainly are. But I've said from the beginning, if this certification wasn't a little difficult, it wouldn't be worth anything to anyone.